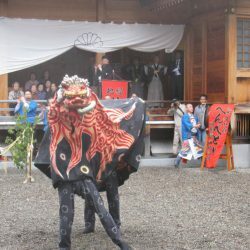 On the Hida side of the Northern Japan Alps, which lie within the Chubu Sangaku National Park, there is a mountain opening festival called "Banryu-sai (Banryu festival)" . This Banryu-sai festival is an annual event held to mark the arrival of spring in this snowy region. The purpose is to commemorate the great work of the holy monk Banryu, who opened up Mt. Yarigatake and Mt. Kasagatake by erecting Buddhist monuments on their peaks. 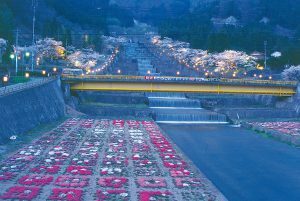 It is also signifies the hope for safety in the Northern Japan Alps. 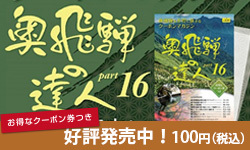 This is a festival held in thanks of the bounty of hot springs in the Hirayu-Onsen area. Prayer sticks with people’s wishes written on them are burned on the grounds of the Hirayu shrine and water brought from each of the hot springs is boiled in a giant pot. The priest sprinkles the hot water over the crowd of pilgrims and prays for their good health and prosperity in business.